Casino Extreme New Player Bonus - Get up to $3000 ! Casino Extreme delivers a well-rounded presentation of video poker, table games, and slots in three playing modes. Members can access games on their computers using instant-play versions or downloadable software as well as on their mobile devices, including smartphones and tablets. 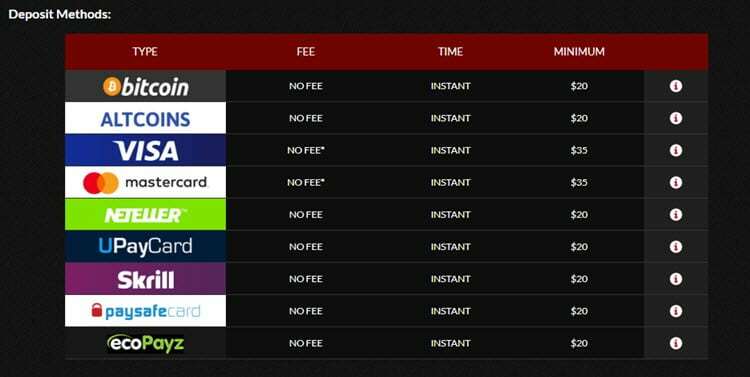 A play for free option is available for players who don't have funds or who simply want to check out the action before making a financial commitment. The games are powered by the well-known software platform of Software RealTime gaming, and the casino has its license through the governmental authorities of Curacao. SSL encryption secures all of the site's transactions. Player's banking and personal details are securely encrypted at all times. Technical Systems Testing evaluates all games in an effort to ensure statistical fairness to all players. Signing Up at Casino Extreme: To become a member of Casino Extreme, you need to click the "GET STARTED" tab on the home page. Just follow the instructions and submit. Once you create your account, it is good on all modes of game play, including mobile, downloadable, and instant-play versions. Casino Extreme play now ! New and existing members have access to lots of promotions during their time at this casino. All of which are worth checking out. The 3000 EUR/USD Welcome Bonus delivers up to 500 EUR/USD on each of a new member's first six deposits for a grand total of 3000 EUR/USD. This welcome bonus is valid on slots and can be claimed using the code “EXTREME”. A wagering requirement must be met along with a maximum withdrawal provision. The 20% Cash Back Bonus is aptly named. No codes are needed. Players simply make a deposit without claiming any type of promotion. If they lose all of their deposited funds, the casino provides 20% of the money back into the member's account by the next day. Offering a unique twist on bonuses, the 200% Paysafe Card Bonus offers a return on a player's initial deposit using this method. A total of 200% is awarded on deposits of 20 EUR/USD up to 200 EUR/USD as long as the player uses the code “REDEEM CODE”. Whether you play for fun or for money, Casino Extreme has a full selection of slots, video poker, and table games for you to enjoy. Alphabetical arrangement makes it easy to preview game availability. Members also have access to reviews on each game. Hundreds of slot games are offered, including Asgard, Bigshot, Bubble Bubble, Aztec's Millions, Caesar's Empire, Coat of Arms, Crystal Waters, and Builder Beaver. Only a couple of dozen table games are featured. This collection contains all of the standard versions of table games such as Caribbean Stud Poker, 21 Face Up, American Roulette, European Roulette, Pai Gow Poker, and Craps. With variations on familiar titles, dozens of video poker games are offered. Members can choose from titles such as Mystery Bonus Poker, Joker Poker, Sevens Wild, and Loose Deuces. As you might expect with a selection of specialty games, the offering is small. This section includes Keno, Bingo, Treasure Tree, European Roulette and Hot Dice. Casino Extreme is a mobile-friendly gaming site. Users do not need to install any software. Its mobile version loads automatically onto your device. It delivers exceptional tapping and swiping capabilities, making it easy to enjoy gambling-on-the-go. Players can enjoy the games at Casino Extreme even if they haven't joined, made an account, or deposited funds. It's easy to use the no-money play mode since all games are in this fun-only version when you first land on the website. Members have easy access to 24-hour customer support. While email and toll-free phone contact is possible, live chat is the quickest way to find the answers you need. Various payment methods are supported for all transactions. Currencies accepted include euro (EUR), United States dollars (USD), and bitcoin, which is converted into euro or dollars upon deposit. For deposits, members can use Neteller, Ukash, EcoPayz, Paysafe Card, Skrill, credit cards, CLICK2PAY, UPayCard, Diners Club International, debit cards, bank wire transfer, and bitcoin. Deposit minimums are small with the exception of 500 EUR/USD for all bank transfers. Withdrawal times vary according to the method used and they range from immediate access to five days. Members can take out their winnings using Neteller, Visa, Skrill, EcoPayz, UPayCard, bank wire transfer, check, and bitcoin. 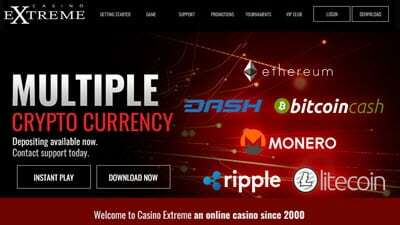 Casino Extreme keeps with the industry standard of capping withdrawals at $4000 USD/EUR weekly.